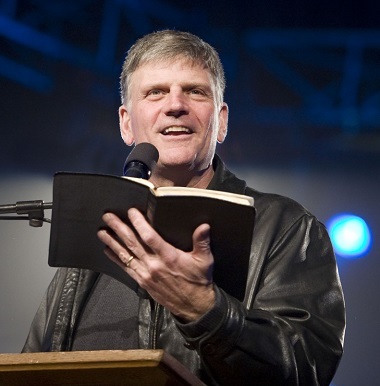 Franklin Graham is scheduled to be in Vancouver March 3 – 5 for the Festival of Hope. BGEA photo. The next couple of weeks will be a serious test for the Church of Vancouver. When Franklin Graham comes to Vancouver as part of the Greater Vancouver Festival of Hope March 3 – 5, some will be thrilled, others will be chilled – and many will pray that we can get through the week without suffering any major damage. I’m finding some enthusiasm, but also plenty of angst and even some anger as I speak to fellow believers about the upcoming Festival. Mayor Gregor Robertson called a meeting with a number of senior Christian leaders and city councillor Tim Stevenson last Friday (February 10) to discuss his concerns about Graham’s intolerant language. Those leaders are expected to release a statement this week – and it will, almost certainly, not welcome his role in the Festival. It is not hard to understand the value of the Festival of Hope. A group of Metro Vancouver leaders visited the Toronto Festival in the fall of 2014 and came away impressed by unity, quality and multicultural nature of the event. They entered into discussions with the Billy Graham Evangelistic Association of Canada (BGEA), which has a high degree of credibility in all circles. Those with long memories will remember the very successful Billy Graham Crusade here in Vancouver in 1984. Everyone knows of Billy Graham’s stature, both within the church and in the broader culture. The BGEA has continued to flourish internationally under Franklin Graham’s leadership since he took over in 2000, as has Samaritan’s Purse, which undertakes charitable works around the world. Exploratory meetings led to the determination to go ahead with the Festival, and last spring (March 31), some 350 leaders attended the official launch at Broadway Church. The leadership team gathered on the stage represented a wide swath of the evangelical church; members of the Catholic Church attended and were clearly in support of the Festival. Since that time, hundreds, maybe thousands, of people from dozens of churches have taken part in a series of Involvement Seminars, Christian Life & Witness training, FM419 student evangelism training and prayer events. It should be noted that many of the Festival-supporting churches have large immigrant populations. A couple of months after the launch (June 16), several local leaders wrote a letter to the Festival leadership committee, opposing the invitation of Franklin Graham. 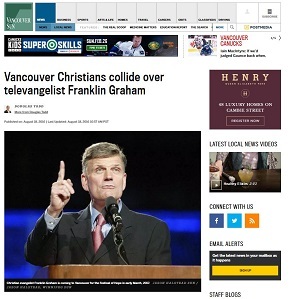 That letter came to light in an August 18 Douglas Todd article (Vancouver Christians collide over televangelist Franklin Graham) in The Vancouver Sun, though it had apparently not originally been intended for public consumption. [W]e seek to share a joyful witness, distinguished by love, and therefore denounce the frequent incendiary and intolerant statements made by Rev. Graham . . . [he] is a polarizing figure: many evangelical and church leaders in the United States have denounced Graham’s remarks. Finally, his ungracious and bigoted remarks have the potential to generate serious negative impact on the Christian witness in Vancouver. . . .
Todd also pointed out that the Roman Catholic Church had withdrawn its initial support for the Festival. Critics argue that he has a number of failings, including making negative comments towards Muslims and other faiths, anachronistic racial views, political bias, alarmist rhetoric about homosexuals, sowing division in the Christian community and drawing an exorbitant salary. We are under attack by Muslims at home and abroad. We should stop all immigration of Muslims to the U.S. until this threat with Islam has been settled. Every Muslim that comes into this country has the potential to be radicalized – and they do their killing to honor their religion and Muhammad. During World War 2, we didn’t allow Japanese to immigrate to America, nor did we allow Germans. Why are we allowing Muslims now? Do you agree? Let your Congressman know that we’ve got to put a stop to this and close the flood gates. 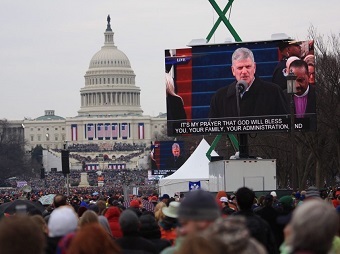 Franklin Graham read a scripture at President Donald Trump’s inauguration and prayed, “It’s my prayer that God will bless you, your family, your administration and may He bless America.” BGEA photo. Concerns about Franklin Graham have been deepened by the polarizing election of Donald Trump. He had not declared himself for either Trump or Clinton before the election (though his bias toward the former was pretty clear). More recently, he has said that he saw “the hand of God” in Trump’s election. He prayed during Trump’s inauguration and supports Trump’s ban on refugees. There have been a lot of protests and discussion about President Donald J. Trump’s executive action on immigration. Some people seem to have forgotten that the priority of the president of the United States is protecting the Constitution and the safety of Americans. . . . Some are also criticizing Christians who support the president’s position on immigration – and I’m one of those being criticized. . . .
Graham is quite isolated in his stand on refugees among evangelical leaders. Slate reported January 29 Christian Leaders Nearly Unanimous in Opposing Trump’s Muslim Ban.
. . . If America bans refugees, it makes a statement to the world that we don’t want to make. It is the picture of someone who sits, arms crossed and turned away, with a raised eyebrow and a ready attack on the helpless, the homeless, the broken. 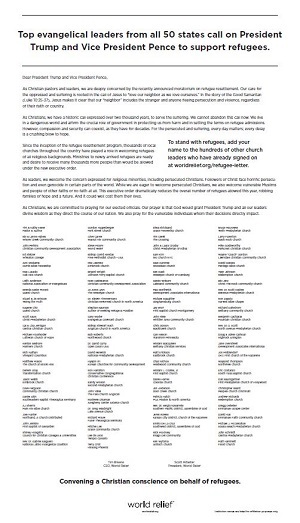 We must do better. . . .
Signees include Pastor Timothy Keller of Redeemer Presbyterian Church in New York, Christian author Ann Voskamp, Bill and Lynne Hybels of Willow Creek Community Church, preacher and author Max Lucado, Pastor Eugene Cho of Quest Church and Leith Anderson, president of the National Association of Evangelicals. Pastor Ken Shigematsu stepped down from the Festival of Hope leadership team earlier this month. 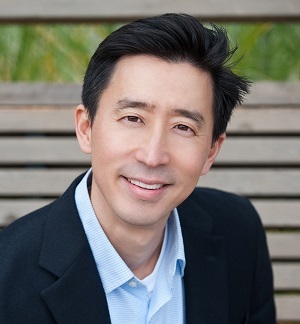 Pastor Ken Shigematsu of Tenth Church was one of the five leaders who wrote the June 16 letter requesting that the Festival leadership team replace Graham (while remaining on the leadership team himself). [M]any of the secular people we are seeking to reach for Christ in our city will be troubled by Franklin Graham saying prior to the election, “I think Donald Trump will be a great president.” . . . In light of what has transpired, if you and the team are open to an alternate speaker such as a Canadian evangelist in the BGEA orbit like Leighton Ford or Ravi Zacharias, or an American like Anne Graham Lotz or Luis Palau (whom John Stackhouse recommended) who is based in Cascadia, I would be glad to reach out to them and ask them about their availability. Regardless of the decision you make, you and this event will remain in my prayers and I’m sure God will use it. However. . . I personally would advocate a proclamation of the gospel while at the same time minimizing unnecessary barriers to reception of the message. After prayerful reflection, I have decided to step down from the Festival of Hope committee. As some of you know, Tenth Church is committed to welcoming and serving people of all backgrounds – including Muslim refugees from the Middle East. Franklin Graham’s advocating a ban on Muslims entering the United States is at odds with our church’s vision and ethos. . . . Therefore, I am stepping down as a member of the Festival of Hope committee. You, and this outreach, will remain in my heart and prayers. A tremendous amount of good will has been built up across denominational and other boundaries over the past few years, through More Than Gold, Voices Together, the Vancouver Consultation, Alpha and local ministerials (involving many from both the Festival of Hope leadership team and those opposed to Franklin Graham’s participation). But there is still a lot of diversity. Few of those who want Graham to lead the Festival of Hope are interested in importing all his political/cultural baggage (some may support some of it). On the other hand, those who oppose his participation support the importance of an evangelistic witness (some more than others). I continue to pray for Franklin Graham and the Festival of Hope and trust that God will use it for his glory. I respect the people on the leadership committee and consider many of you personal friends. All of you are colleagues in ministry. . . . I do hope that the other leaders who oppose Graham will be willing to recognize some of his contributions, even as they oppose his participation in the Festival. He has reached many people for Christ over the years, and Samaritan’s Purse brings aid and relief to people all over the world, including in many Muslim-majority nations. A recent Province article, for example, was headlined Beauty salon in a war zone: Canadians with Samaritan’s Purse working [to] give Yazidis their future back. 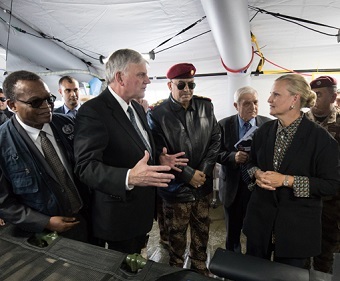 Franklin Graham speaking with UN Humanitarian Coordinator for Iraq Lise Grande, at Samaritan Purse’s new field hospital outside Mosul January 12. Samaritan’s Purse photo. We’ve reached out to a number of organizations, asking, begging them to step forward. Dr. Graham, Samaritan’s Purse answered that call. We can’t thank you enough. You built this hospital in record time. Most of all we want to thank you for saving people. Because Samaritan’s Purse is here, thousands – tens of thousands – of people will survive. This is a time for the leadership of the Church of Vancouver to show what it is made of. That won’t be easy. A strong contingent is supporting the Festival of Hope. Others are marshaling in opposition. And many will just be hoping and praying for the best. It would be wonderful if all parties agreed that the various church leaders will continue to work together in the wake of the Festival of Hope – that disagreements on this one initiative will not derail the tide of cooperation that has been gathering for years now. The Festival of Hope team at the time of the launch: The executive leader was Giulio Gabeli, pastor of Westwood Community Church in Coquitlam. Co-leaders were Barry Buzza (Northside Foursquare Church, Coquitlam); Kevin Cavanaugh (Cedar Grove Church, Surrey); Yiu Tong Chan (Vancouver Chinese MB Church); Sandro DiSabatino (Glad Tidings Church, Vancouver); Norm Funk (Westside Church, Vancouver); Ed Hird (St. Simon’s Church, North Vancouver); Darin Latham (Broadway Church, Vancouver); Yani Lim (Bethesda Ministry of Love); Wayne Lo (Chinese Christian Church of Vancouver); Aldrin Navo (Jesus Rock of Ages Ministries); Ken Shigematsu (Tenth Church, Vancouver); Sam Owusu (Calvary Worship Centre, Surrey). Since the launch, John Best (Willingdon Church, Burnaby) and Daniel Cheung (Vancouver Chinese Renewal Fellowship) have joined the team, while Ken Shigematsu has left. Advisory team leaders are Dave Koop and Cheryl Koop of Coastal Church. Prayer team co-leaders are Bayo Adediran (Grace Chapel, New Westminster) and Dave Carson (Intercessors for Canada). James Hung (Vancouver Chinese Missions Training Centre) will look after counselling and follow-up. The communications team leaders are John Randolph (Praise 106.5); Catherine Robertson (Eaglecom Marketing); and Laura Lynn Tyler Thompson (700 Club of Canada). The five signatories were Tom Cooper (president, City in Focus); Tim Dickau (senior pastor, Grandview Calvary Baptist Church); Marjeta Bobnar (ecumenical and interfaith relations, Roman Catholic Archdiocese of Vancouver); Tim Kuepfer, (then senior pastor, First Baptist Church); and Ken Shigematsu (senior pastor, Tenth Church). Post on Franklin Graham’s Facebook page, July 17, 2015. Post on Franklin Graham’s Facebook page, January 31, 2017. ← Around Town: Refugee housing needed! Brian McConaghy, Carolyn Arends . . .
Great journalism Flyn! I certainly feel torn. I do think Graham’s views and approach are sad, despite the good he does do. We live in what van Duzer termed the messy middle. We just can’t get it right this side of Jesus coming again, so best to stick with our pleads for grace! We need it! Hi Flyn, excellent balance on a very complex story. Thank you. I appreciate the article but understanding that these events are planned so far in advance it is troubling that another country’s politics has to play into what was obviously a decision made years ago and previously supported by all the committee members. May God be glorified in this and may the politics be left out. Come and hear the man for yourself, decide for yourself and remember the Festival of Hope is about worshiping our God because He is the point! I totally agree with you, Lynn, this is about Christ’s church in Greater Vancouver working together as one sharing the gospel of Christ to the people in our cities. It is not about American politics. Why during the last week or so, a couple dozens church leaders would come together protesting against the speaker the organizer invited long time ago? If these leaders want another speaker, they can do that on another day with another event. Let us work together to bring the harvest to Christ. We live in a post- and anti-Christian world. Our God is sovereign. It is my hope and prayer that we stand true to our convictions and in obedience to our faith. Thanks for addressing this, Flyn. First, as a Canadian who supports our Christian community, I’m really tired of the apparent need to bring in American speakers for many of our events, whether teaching or evangelizing. There are many Canadians who could speak just as well. (Women as well as men, BTW.) It’s time we need to open our minds to those who aren’t only published by American CBA publishers. Secondly, I think in light of the polarizing factors brought about by this election, it would be a travesty to have Franklin Graham speaking at this event. Not to mention highly embarrassing for many of the people who might attend and then realize he has fully supported Trump. In setting the context for this event, we should not forget the massacre of six Muslim men while praying in the Islamic Community Centre in Quebec City, and the thousands of people who over the course of a few weeks attended rallies across the Lower Mainland decrying Islamophobia, white supremacy and the US ban. His view that Islam is an evil religion and his influential position within sectors of the religious world help to fuel the discrimination and violence that Muslims experience in North America and elsewhere. It is also deeply disturbing that Graham’s charity work can co-exist with his politics of exclusion and hate, and that the director of a charitable organization to the poor and an evangelistic organization proclaiming “good news” collects a salary of close to $1 million. He is a wolf in sheep’s clothing; he must be firmly opposed and his presence banned. I appreciate this thoughtful article. Thanks for including his incendiary comments, it makes them harder to ignore or minimize. Graham is going to damage the gospel witness here in Vancouver. His outspoken support of Trump, nationalistic idolatry and anti-Muslim (and thereby anti-refugee) positions will damage the church’s reputation here. Holding him up as a model Christian leader normalizes his hurtful views, and his absurdly opulent lifestyle (making 800 thousand dollars a year as a CEO of a charity, how is that living simply and humbly like Jesus?). These things have concrete consequences: they will reduce church peoples’ political will to welcome refugees and speak out against Islamophobia and LGBTQ hate. Graham should not have been the one chosen to bring the good news of Jesus (which, preached properly, ought to be good news for the poor and oppressed). As a pastor of young people, this bums me out. Bringing Graham and his views to Vancouver, and giving them a prominent role will make it harder for young folks to identify as followers of Christ. Sorry, I can’t agree with you! I am saddened that this event that should have been a shining light of hope to our city is now marred. The witness of the united church marred by choosing a speaker whose faith and witness is so weakened by his nationalism and opulent lifestyle. I pray that despite the presence of this speaker, people will grasp the message of the gospel. I pray that this event does not further weaken the witness of the church in our city. Thanks for the balanced article Flyn. It’s certainly a complex issue. This is an abuse of power, and a serious affront to the way of Christ and his kingdom. I hope and pray that pastors and congregations supporting this event will have the courage and inspiration to come to their senses and withdraw their support of Graham’s presence at this event. I understand it is likely far too late to prevent him from coming, However, it is not too late for pastors and churches to boycott the festival of hope event, and trust in God’s work amongst their own communities without the outside influence of Franklin Graham. “. . . blatant, repeated, exclusionary and hateful comments” Graham does not make anything of the kind to “individual” Muslims. He does “criticize” Islam and those that support and lead this political ideology. You sir; would do well to give him and me that right – just as you apparently have the right and freedom even to make false accusations . . . THAT ARE PERSONAL. Gregor Robertson calls a meeting because a disfavored speaker is scheduled to address a supposedly religious event. Meanwhile, Trump-tainted Franklin Graham looks to parachute onto a Vancouver podium. Two instances of watching the ever power-hungry City of Man seek to appropriate the City of God. What a profoundly ironic homology. This is an awkward, difficult, thorny situation. Nevertheless I would be very disappointed if we curtailed Mr. Graham’s freedom of speech. What’s next? Are we going to ban Ayaan Hirsi Ali’s books? (See Infidel; and Heretic.). Or see Robert Fulford’s article in the National Post, Feb. 11, p.A17). We can love our neighbours without being naive. Let the man speak and let the controversy roll. Christians are not control freaks. This is good journalism and a service to Vancouver’s Christian community. Thanks for writing this. While I do not support an event associated with Franklin Graham because of his recent actions, I believe that we can agree to disagree and still work together on other initiatives. While the event itself presents a challenge, the hard work really be avoiding in the aftermath. It will be easy to break into camps and ignore one another. (1) I am primarily concerned for those who are vulnerable to expressions of hate and believe that we should oppose this courageously. Those particularly vulnerable include refugees as well as others who are being targeted with violence (people who identify as LBGTQ, folks with specific religious affiliations, those from specific racialized group). Trump and those like Franklin who explicitly support him are stirring up a serious movement of hate (http://www.alternet.org/election-2016/united-states-hate-has-exploded-under-trump?akid=15213.35645.yRU63C&rd=1&src=newsletter1072352&t=3) that needs to be courageously denounced and opposed, especially by those of us who are committed to following the prince of peace. We can not support Graham without implicitly supporting this rhetoric of hate. (2) I am concerned that by supporting Franklin’s visit, we are asserting that his hate-filled political view is a valid Christian perspective. My fear is that the Church will fail to learn from our history and once again align with the powerful oppressors instead of those who Christ aligns with: the poor, the weak, the sick and the outcasts. What kind of Christianity is Franklin converting people to? (3) Franklin is extremely divisive, and continuing to support his visit will undoubtedly result in Church disunity. Therefore – for the sake of peace, love and unity – please oppose Franklin Graham’s visit. I did not know Franklin Graham’s stand til now. I was very surprised and cannot figure out how he could jump on the religious right Republican bandwagon. I would be unhappy if he would state his stance here in Vancouver where the overall culture is against Christianity at the best of times. But the greater issue of course is that Franklin Graham could embrace unloving points of view re: Muslims and other human beings. I don’t blame those who are concerned about bringing him here. I am too. A poignant and probing primer on a portal that takes us into some worrisome Christian tendencies (albeit, sadly so, not new). The fact Missions Fest a few weeks ago refused a Christian Palestinian booth while offering ample room for Christian Zionists should alert the minimally sensitive that faith is askew. The more disturbing fact that Festival of Hope would bring Franklin Graham to Vancouver (he, like other American right of centre evangelists, mixes faith and politics in a way that perpetuates a distorted gospel) does need to be noted. What does such an invitation say about a naive and populist notion of Christianity? We should also be attuned to the fact that the Evangelical Fellowship of Canada (EFC) has formed a dialogical alliance with the Centre of Israeli and Jewish Affairs (CIJA) – a decided Jewish Zionist organization. The Palestinians become the sacrificial lamb for such a dialogue. Trump and Netanyahu are walking hand in hand these days. The NeoConstantinian union we are seeing these days between the USA-Israel, Trump and the Christian right of centre and a thin faith and politics is being embodied in a most disturbing way in Missions Fest, Festival of Hope (hope for who?) and EFC-CIJA. There is a desperate need for a Christian ginger group and 5th Column to question and oppose such tendencies. Thanks for the informative article. It is surprising how the power and intimidation of the need to be politically correct has brought us to the place that we would not dare to allow a prophet to speak any truth that might offend our socially acceptable sensitivities. Furthermore, how could we tolerate anyone who has not jumped on the bandwagon to judge, condemn and malign Donald Trump? I personally know American Godly spiritual leaders who know Donald Trump; shall I believe them or the media who is obsessed on destroying their president? Must we make the gospel “seeker friendly” or we might not win some? Are there still leaders who are not ashamed of the gospel, believing that it is the power of God unto salvation? Let’s pray for the Lord’s presence to invade our city with light to expose all darkness, flood us with love and salvation. So simple, so clear and precise. Thank you Albert Zehr. Although the concerns expressed about Franklin Graham do cause us concern too, we would like to plead with the Christian population to stand together for this opportunity to bring the Gospel to our city. It never is a good idea to withdraw and so accentuate what divides us instead of working together to deepen what unites us. Let’s pray Franklin will have wisdom not to touch on subjects that are not helpful in proclaiming the Gospel. We are sure he must be aware of the criticism there is, and we believe his heart is for the “unity, quality and multicultural nature of the event.” May the Lord pour out His mercy and grace on ALL who come to the events, leading them to know Jesus and be recipients of His amazing offer of salvation. I appreciate this thoughtful article as well as Dr. Ken’s prayerful wrestling with how to best help the Festival of Hope have an effective witness. The gospel in itself can be offensive to non-believers, but we need to guard ourselves from adding tacking on extra things which may offend those who do not yet believe (and need to hear the pure message). Just because there were immigration bans in previous world wars, that does not make them right. Us Canadians still wrestle with a great deal of guilt about things such as the Japanese internments of WW2 in our own history. Franklin’s comments would drive many Canadian to be even more convinced how wrong his approach sounds. Thanks Flyn for the timely article and the insights within. While inviting Franklin Graham may seem a good idea to some less familiar with history and culture, the church was engaged in the crusades to the Islam world and in developing the Doctrine of Discovery which legitimized the epic colonial expansion by terminating the rights of all people of color. Over five centuries of practicing such worldwide has entrenched in many Anglo-European psyches a distorted sense of entitlement and cultural superiority, and in many Christians a compartmentalized life with a distorted idea of the kingdom of God. In BC, the carnage by colonial racism is far more than Residential Schools. However due to the church long silence on the on-going injustice and suffering imposed on Indigenous people, many still refuse to step into any church. While some would argue that the Festival of Hope is for far more than the Indigenous people or minorities, we need to question why should we invite a speaker whose idea of Good News has been bad news for some? For others who believe one’s ability to preach the Gospel should be considered separately from one’s public disrespect for the Muslims, James 3:9-12 would be a useful reminder. To be constructive, the real hope for the church is to embody rather than more talk about the invisible righteousness and Good News of His kingdom. There are much that the church needs to humble itself in this “discovered” land of North America, lest we be reliving the time of Jeremiah when false priests and prophets for their own gain would cry “Peace! Peace!” when there is no peace. “Good news” to some is “bad news” for others. The word of God is like a double-edged sword – you can accept it or reject it. But remember, there are always consequences, and in this case, serious consequences. Thank you for your research, Maria. Have a wonderful day in the Lord! Are you attempting to minimize the violence and oppression historically inherent in most forms of Islam by bringing up the “Crusades?” Surely you know that as terrible as they turned out to be, they were a REACTION to the constant attacks by Muslim invaders that attempted to overrun Europe – and almost succeeded – for centuries! In any case, bringing that up is a rather bizarre argument against Christians inviting the son of Billy Graham to speak at a Christian event. Imams worldwide regularly call for the killing of Jews and Christians, with barely a whisper of protest (except by a few vigilant Jews). At least even the most “right-wing” Christian leaders don’t call for the murder of those they disagree with! And just because someone thinks Trump was a better result for America than Hillary, should they be banned from Canada? Really??! Mr. Chu you refer to James 3:9-12 which is referring to cursing one and other but that is not what is going on here. We are not cursing Muslims but revealing the evil which is committed through their religion against the innocent and we are called on to stand up for the innocent. Our future generations are our children and therefore if we don’t stand for the Kingdom of God and His righteousness now . . . and allow this evil to destroy our faith and our land . . . what do we have to pass on? There is nothing unGodly about standing up to unGodly things. We are called to do so. Do not be bound together with unbelievers; for what partnership have righteousness and lawlessness, or what fellowship has light with darkness? You therefore, beloved, knowing this beforehand, be on your guard so that you are not carried away by the error of unprincipled men and fall from your own steadfastness. Really appreciate this important and informative article, Flyn. I had read about the leaked letter but hadn’t heard much in the aftermath. It’s interesting that Franklin Graham is coming in 2017 – 100 years before, French E. Oliver, a Presbyterian evangelist associated with BIOLA, came to Vancouver for a nine-week evangelistic campaign and he too divided Vancouver’s Christians. What people – Christian or not – need to hear these days is hope. Real hope. Not only that God loves us exactly as we are, but also the hope from comes from verses such as “They will know you are my disciples, if you love one another.” John 13:35. Right now, the church in the US is teetering on the verge of an attempt to take it back to the 1950s when white men had all the power and minorities and women had to be very brave to go against them. A message to unbelievers based on that foundation will go nowhere. We all have a choice. The Pharisees and Sadducees did, too. As followers of the living God, we need to choose compassion and love over power and authority. Biblical prophets challenged their leaders and nation to live according to God’s concerns. “He has shown you, O mortal, what is good. And what does the Lord require of you? To act justly and to love mercy and to walk humbly with your God.” Micah 6:8. Politically correct or Biblically correct? Come on Church, Bride of Christ, let’s get our Discernment Caps ON. 1 John tells us Jesus came to save the lost, take away sin and to destroy the works of the devil. We don’t want to lose the lost, and do the devil’s work. Mark 3:25 says A house divided can’t stand. Wonder who the Bible says is behind that? Let’s keep the main thing THE MAIN THING. Thanks Flyn for getting us all thinking and talking. And thanks Franklin for rattling our cage. All this is so much more interesting than the status quo, eh? I can’t help but wonder how much did Jesus’ association with such a diverse group compromise his Gospel message? Might he have been smart to leave Simon the Zealot behind? And what about Judas, the man who wanted a six figure salary? The violent Peter who exercised his inalienable right to bear arms? The fence-sitting Thomas who was not quite sure what he believed? Matthew the tax man in the employ of a foreign government? I think Franklin fits right in! We are none of us perfect and if Jesus was OK working with people like that – like us – well OK. Franklin is coming whether we like it or not, and the Gospel he preaches will only be credible to Vancouver at large if we are seen to love each other as one. Diversity is what we are all about and I say “Vive la difference!” but also “Vive la unity!” we all share in Jesus. OK – I think the answer would be to include an equally prominent Christian headline speaker who is supportive of refugees, religious freedom, LGBTQ, etc., to provide a counterpoint in presence. Justyn Rees – Diversity is what we are all about, “Vive la difference!” but also “Vive la unity!” we all share in Jesus. Do you agree and will you advocate for this diversity? I like your plan but would say, that is the default experience. A rally with a single, opinionated preacher would be the diversity we need. Justyn, a very thoughtful response. Where does the power of God come into our considerations? Christians on both sides of the border demonstrate fear of one thing or another. Are we going to decide these critical questions based on fear? Perfect love casts out fear. Bans on whole groups of people are based on fear – what is motivating Mr. Graham to take this stand and how is this a witness to the love of God in Christ? As you know, there is something out there that constitutes “evangelism without the Gospel.” The founding of the three Abrahamic faiths contains the story in Genesis 18 of Abraham and Sarah welcoming strangers, despite the risk: “entertaining angels unawares.” This fundamental embrace of hospitality is leitmotif throughout the rest of the Judeo-Christian story. Franklin Graham however is known for exclusion, the very inversion of the Gospel. In U.S. Uncut, there is a story of January 18, 2017, by Kenneth Lipp with the heading: “Pope Francis: You cannot reject refugees and call yourself a Christian,” quoted in part below, when Pope Francis addressed an ecumenical gathering in Germany last fall. He captured the essence of the Gospel in its wideness of welcoming mercy to any and all. Pope Francis condemned the hypocrisy from Christians who are merciless to refugees and people of other faiths, addressing a gathering of a pilgrimage of Catholics and Lutherans from Germany, reports Catholic News Service. “This is not something I’ve read in books, but I see in the newspapers and on television every day,” Pope Francis said. “The sickness or, you can say the sin, that Jesus condemns most is hypocrisy, which is precisely what is happening when someone claims to be a Christian but does not live according to the teaching of Christ. You cannot be a Christian without living like a Christian,” he said. “You cannot be a Christian without practicing the Beatitudes. You cannot be a Christian without doing what Jesus teaches us in Matthew 25,” a reference to what is known as the Parable of the Judgment or the Parable of the Sheep and the Goats. “It’s hypocrisy to call yourself a Christian and chase away a refugee or someone seeking help, someone who is hungry or thirsty, toss out someone who is in need of my help,” said Pope Francis. Now that’s Good News! Amen. The “change needed” for all the characters Justyn Rees mentions is of course “metanoia”: absolutely central to Jesus’ preaching. Justyn, you’re an evangelist. Is metanoia not quintessential to your preaching? Or is metanoia for you just spiritual? Remember: “By their fruit ye shall know them.” Franklin Graham’s “fruit” is exclusion, and embrace of a new President who builds walls, exudes exclusion and exalts anti-hospitality. In his book, Thy Kingdom Come: How the Religious Right Distorts Faith and Threatens America, Randall Balmer cites Billy Graham’s concern about a marriage between the political right and religious fundamentalism. Billy Graham warned, “I don’t want to see religious bigotry in any form. It would disturb me if there was a wedding between the religious fundamentalists and the political right. The hard right has no interest in religion except to manipulate it.” Parade Magazine, 1981. Franklin Graham is poster boy for that union. Sadly, the marriage constitutes mutual manipulation. Franklin Graham’s “fruit” is truth in proclaiming the gospel. As for building walls, better to have walls than to experience the violence that follows radical Islam – Europe and the UK are living examples of Islamic terror. The following excerpts come to mind: “. . . The fundamental conflict in our culture and in our politics right now is a simple one. It is conflict between those who love the truth and speak the truth and those who hate the truth and want it repressed. Those of us on the right still say it and believe it. We are for open and free discourse and open and free debate. We want everybody to have the opportunity to say their piece in the dialogue over things that matter, whether the topic is religion, homosexuality, marriage, politics, evolution or the climate. We are eager to have a vigorous and open exchange over these matters and let the best arguments win. We look to our church leaders to lead us, but some do not have the spiritual strength to stand the test of intimidation. This is a separation of the wheat from the chaff. As a Catholic, I am very disappointed that my church has opposed Franklin Graham. Thousands of petitions have been sent to him pleading for clarification on statements he has made on Catholic teaching. Response – silence. P. Francis has his own plan, his actions speak for themselves. Franklin Graham has it right – let people who desire to hear him speak truth to issue have the opportunity, if we live in a democratic country. The mayor need fear no violence from Christians. Flyn, I fear that most Christians are asleep at the wheel when dealing with the subject of Islam and immigration of Muslims. Islam, as literally interpreted, is essentially antithetical to our Judeo-Christian heritage and to our Western democratic values. This is confirmed by prominent former Muslims, notably Ayaan Hirsi Ali (please find her on YouTube). As well, amidst the rising tide of multiculturalism and inclusive thinking, many Christians have lost sight of the exclusivity of Jesus Messiah as “the Way, the Truth and the Life,” to the point where they are reticent to highlight this polarizing distinctive. Ken Shigematsu should have prayerfully kept his opinions to himself and have remained on the Festival of Hope Committee. I suspect his departure will now make it difficult for other local churches to partner with Tenth Church on future L.M. evangelistic ventures. Great wisdom in your words. All man are equal and all are sinners! Jesus just have one way to all of us, that repent! No other way around in front our Lord. Just as a point of reference, I was extremely disappointed from the first moment I heard that Franklin Graham was going to be coming for this event. And I have heard of other churches who decided not to participate long before Mr. Shigematsu’s comments. If we wait for everything to line up before we cooperate, we will never cooperate! We have a mandate from the Lord to take the Gospel to all people, and at least on that point we can agree. Let’s move ahead on the issues we can agree on! May the Lord have mercy on the people who still so badly need Him in Vancouver, and may they be blessed by the cooperation of God’s children on March 3, 4 and 5. Franklin Graham is a true follower of Messiah Jesus. Because he speaks the truth of Yahweh’s word, he is called a racist, bigot and hater. That is a true follower of Yahweh’s word because he speaks the truth. What does the Koran say, but to kill the infidels. Who are the infidels? Anyone not a Muslim. That’s you who say you are a Christian. That’s not hate speech, that truth Franklin is talking about. This ban is on terrorist countries. President Trump wants to protect Americans. Is that truth so hard to see? It has nothing to do with immigration, but protection of people on American soil. If that is hate, you go ahead and live in Iran, right next to ISIS and see how you like it. Franklin Graham’s fruit is truth, just like Jesus when he stood against the religious rulers of His day. Look at the underground church in China, Christians in Muslim countries. It is horrible the inhumanity suffered by our brothers and sisters there. You people could care less in your comfortable lifestyles. Franklin Graham speaks the truth in love, will you? Lord, please forgive us. We have sinned against you. We knowingly or unknowingly are dividing Your body which is purchased by Your precious blood. You are so right Karen . . . we ‘must’ stand together. I am so disheartened by the majority of Christian believers criticizing Franklin Graham for standing for ‘Godly’ principles and beliefs. This rampant theme of ‘inclusion’ and ‘political correctness’ has infected the Christian community and caused it to lose sight of its loyalties to God the Father, the Holy One, and in so doing has allowed the enemy the room to grow exponentially in false teaching that goes against the very Word of God. Homosexuality ‘is’ wrong as is serving ‘any’ ‘other’ god. Franklin Graham is preaching the Word of God and in so doing . . . being bold enough to love those living in sin by letting them know it is ‘indeed’ sin. How else will they know to turn from it when so many so-called Christians don’t have the backbone to do the same. That is not love and it certainly isn’t loyalty to God the Father and Jesus Christ our Lord who laid down His life so that such sin could be forgiven. We ‘must’ be united in this fight against the evils going on in this world. Jesus walked this earth and stood against the pharisees and the leaders in order that ‘we’ would have eternal life. He never was backed into a corner or kowtowed to political correctness and false teaching. Rise up fellow believers and pray for wisdom because most of you are walking as the fools of Proverbs. This is a time to support ‘courageous’ leaders who are willing to take a stand and call it what it is in order to bring healing to this land and that the lost would be set free. Bless you and may God’s grace come upon you. The gospel is truth and it cannot be watered down to suit our “feelings” or behaviors – we have the option to accept or reject it. Unfortunately this article does not give all of the facts – it is a well known fact that Franklin Graham has done a lot of good for poor and under-privileged groups worldwide. He is a man of faith and a man of truth. Unfortunately, our politically correct world does not appreciate these virtues. Those who support a culture of “live and let live” will naturally do all they can to besmirch his reputation and misrepresent him, thus trying to shut down the truth. This is a strategy that many use to limit other people’s freedom of speech, while preaching tolerance. As for the churches that have withdrawn their support from this event, it is sad that they would forsake the truth and allow themselves to be intimidated. The issues at stake are vital issues and to gloss them over would be a mistake. When the likes of Madonna and Katy Perry insult Christians, I don’t hear any complaints from our politicians. We proclaim to the world that we live in a democracy – you would hardly know it seeing just who is spearheading this attack against Franklin. Sadly, tolerance and freedom of speech seem to work only one way – why are these Vancouver officials and churches afraid? Why are they so ready to shut down other people’s right to the democratic process? Let those who don’t agree with Franklin G. stay away from the event. To the organizers, kudos for your courage. Very well spoken and I wholeheartedly agree with you. I think this shows who really is Lord of our lives. This is an evangelistic event. If I go somewhere I try to go cause the Lord leads me to go. If the Lord leads me to attend a church I do, conversely I only leave a church when I am led to leave (and not because of something that was done). I am going to ask the Lord to help me bring someone who will receive His message (which might or might not be from the pulpit). What a lovely non-philosophical and non-political stance to take. We have to put up with error even within our own heart, until it is fully cleansed. Hopefully, you won’t hear any rants about hating gay people, but if you do, use it to minister to your guest. I’m sure there are many others willing to sit down with sinners and defend truth. Now against this backdrop let’s imagine how Jesus sees the upcoming Vancouver Festival of Hope. I imagine that he sees his people, across denominational lines, banding together in prayer for an opportunity to proclaim his transformative Gospel through a mega rally event. These Christian leaders then evaluate the best available speakers and programs and, after much prayer and collaboration, they make their best choice and invite Evangelist Franklin Graham and his Festival of Hope team to partner with them. Jesus sees that, on the front lines, Samaritan’s Purse offers relief to everyone in need, regardless of their race, religion, gender or lifestyle practices. He also notes that Samaritan’s Purse Canada spends a thrifty 6% of their donor funds on administration and that they have received the highest grade (A+) for efficiency and governance in the 2016 report on Canadian charities by MoneySense. Of course Jesus notes Mr. Graham’s annual salary, and He also sees his heart. I imagine what pleases Jesus most about our brother Franklin is his uncompromising allegiance to Him, his love in action for those in distress, his desire to introduce those without hope to Jesus as their Saviour, and, yes, his expressed desire for God’s people to work and pray together so that “. . . the world will know . . . that you love them . . .”. Thank you for the gracious and sober words. May we see beyond our natural differences and unite in embracing the power of the cross. Somehow the Lord allows the message of His grace to be carried by imperfect vessels, so that the glory will be to Him and not to us. The Festival of Hope is to bring hope to all people in the Greater Vancouver area. I keep reading comments about ministering to the poor, the sick and the down and out. Yes the Festival will minister and bring hope to those people. But what about the millionaires, the successful middle class and those that are “up and out”. When the focus is only on the poor and “oppressed,” you are ignoring a huge segment of Greater Vancouver. Those that are wealthy need Jesus just as much as those who are poor. The Festival of Hope has never been about the political left or the political right. It has only been about pointing people to the need of a Saviour and the hope and freedom that comes from a personal relationship with Christ Jesus. It deeply grieves me that the five who originally signed the letter have brought politics into this Festival. There was unity and no politics previously. It further grieves me that instead of just expressing their opinion, they went public with it and are now campaigning actively against the Festival in the media, at the civic level and in the Christian community. That to me is as divisive as they are claiming Franklin is. We need to actually read who the widow and the fatherless are as they are the ones that have ‘no’ family to care for them as it is the responsibility of the family to come to their aid first and if they have none then the church should care for them. In this case the ‘men’ are fleeing these countries instead of bearing arms and fighting to protect ‘their’ women and children. Instead they are counting on our men and women to go to war for them and sacrifice their lives. Men are leaving the women and children behind and travelling either to Europe or through multiple countries and overseas and through jungles to arrive in Mexico . . . and then get through the US to Canada’s border . . . He should be protecting his family and fighting for his country. People have lost perspective of what is actually going on here. It is indeed horrendous but helping them on their own soil would be much more effective than the powerful impact that this mass migration has caused. One of the ten commandments is . . . “You shall have no other gods before me”. To make the top 10 I take that pretty seriously and I would have hoped that the leaders of this country would too. I choose to put God first and with that comes a commitment to stand against this lie that we must accept all the gods coming into this country through ‘false religion and ‘false’ gods. How will the world know that we are set apart if we are not bold enough to stand up for our faith . . . and yes that will mean there will be those who are offended but we will have nothing left if we don’t, and they certainly aren’t concerned about offending our Lord and Saviour. There is nothing godly about refusing to stand up for Christian beliefs. Jesus never moved away from boldly speaking the truth. Yes we are to care for those in need but we need to be responsible in understanding who they actually are. We have many, many people within Canada who are not having their needs met currently while the East self-destructs and places that burden on the whole world. In 1 Timothy, Paul lays out more detailed instructions for how to care for widows (1 Timothy 5:1–16). First, Paul puts an emphasis on a widow’s family taking care of her, instead of leaving it all up to the church. “If a widow has children or grandchildren, these should learn first of all to put their religion into practice by caring for their own family and so repaying their parents and grandparents, for this is pleasing to God” (1 Timothy 5:4). Paul instructs that, for a widow to be supported by the local church, she must be over the age of 60 and she must have been faithful to her husband and have led a godly life. And she must have no family member to care for her (1 Timothy 5:9–10). The bottom line is that all widows should be receiving the care they need, without anyone getting overburdened by the responsibility. Well said Ron Clark. It is upsetting to see this division among the body of Christ. We are called to be salt and light, to speak truth in love. At times the message of truth can appear to be harsh to some, but let us not be deceived. The culture we live in is destroying us – morally, physically and spiritually. If we continue to be divided and deceived, we will perish. We have been given plenty of warnings on these issues that Franklin G. speaks on, both in Scripture as well as in science and statistics. On the Islam issue, moderate Muslims themselves, here in Canada, are exposing the deception of radical Islam. Why are our leaders shutting their eyes and their ears to all of these warnings? These moderate Muslims themselves tell us that Westerners are very naive and gullible. ISIS tells us that they are using the migrant issue as their strategy to infiltrate the West. ISIS says that they will occupy the Vatican. AN OPEN LETTER TO ALL CANADIANS – Canada is under attack! ISIS Declares That They Will Invade Jerusalem, The Vatican, And Spain, And Destroy the Christian Cross. Is this not sufficient evidence of their intent? What would it take to convince us that we must exercise caution and commonsense. We can understand why politicians dance on issues, but churches and pastors who profess to be Christian? I would like to know what their rationale is. My heart grieves. Evil spirits of political correctness are working in the disobedient. We must pull together and stand firm to resist the devil, for the Bible says, “Submit yourself to God and resist the devil. The devil will flee away from you.” Let us claim Christ’s victory and expect great harvest from these three days. Our Lord Jesus be raised up high and many will come to Christ! The proof is in the pudding. The Festival of Hope March 3 – 5 was very well attended and meetings had such an exciting energy. So many young people and great music song praise and worship. Each night crowds came up to the stage for prayer! Franklin gave a clear message of salvation. Why was there such an out cry against Franklin? He and his dad have and are being used by God through history (dad) and today. Franklin Graham stands for holy living and loving God. He also loves people; if he did not Samaritan’s Purse would not exist. The Festival of Hope Vancouver 2017 was so exciting! The Holy Spirit was there. Some very bitter and secular voices in power hate the gospel because their lives are so prideful and sinful. They cannot stand Christianity as in their eyes Jesus is a foolish belief. Christianity makes them puke, not Franklin Graham. When the apostles in the early church spread the word of the gospel it cost most of them their life. Sadly the hateful voices who hate Christianity have even swayed some so-called mature pastors. Pastors had better read Romans 1 again and do a study on the devil’s devices and tricks, including what sexual sin is and what cults are. Yup. The proof is in the pudding. Despite having a speaker whose lifestyle and rhetoric would make churches pass over having him in their pulpit, God used him and his message. Jesus is Lord. I am thankful for those who spoke up. It showed the city that the heart of the Gospel is for all. How much better it would have been if we as the church had had a speaker whom we all agreed best represented the gospel. God often works despite our choices. A testament to His sovereignty, not to the character of Franklin. He is Lord. Now let’s get back to reaching those around us through our relationships. I pray that those who made a decision now experience Grace and acceptance as they are discipled. Thank you Albert, Karen, Tanya, Maria, Betty, E.K., Al A. for ‘recovering’ some of my confidence in true Biblical Christianity! After reading the earlier comments (some were actually ugly), you’all have obviously done the proper discernment research and acquired a Biblical Worldview . . . as opposed to the ‘Vancouver closet’ perspective.